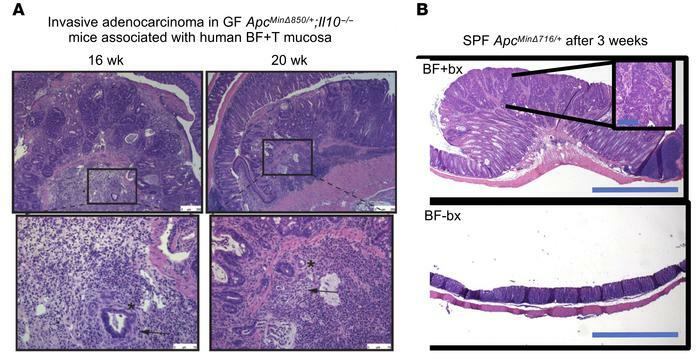 Histopathology of colon tumors from mice associated with human biofilm-positive mucosal tissues. (A) GF ApcMinΔ850/+;Il10–/– inoculated with human BF+T tissue homogenate develop carcinoma with submucosal invasion after 16 (left panels) or 20 (right panels) weeks. Original magnification, ×50; scale bar: 250 μm (upper panels). Bottom panels represent insets of top panel boxed areas demonstrating invasive adenocarcinoma. Original magnification, ×200; scale bar: 75 μm. In addition to high-grade glandular dysplasia in the mucosa, there were infiltrative glands in the submucosa (asterisks). These submucosal glands also displayed desmoplastic stromal changes (arrows). The overall features were diagnostic of invasive adenocarcinoma. (B) Colon histopathology of SPF ApcMinΔ716/+ mouse inoculated with BF+bx (top panel) or BF-bx (bottom panel) for 3 weeks. Top panel displays a large tumor with multifocal dysplasia and a region of intramucosal adenocarcinoma (inset). Original magnification, ×4; scale bars: 1 mm (upper panel). Original magnification, ×20; scale bars: 0.1 mm (lower panel).